It's been almost a month since she died, and I feel like I can now finally come back to reality and my friends. This entry is about her. 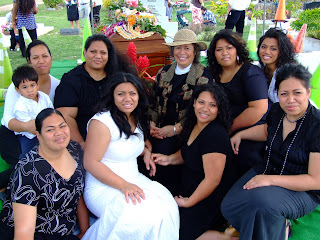 She was born in Samoa in 1973, and with the rest of the family moved around the United States, living many years in Hawaii and then finally settling in California. She was never married, though several proposals had come and gone throughout her life, and has no children. But being one of the oldest of 12 children, she had a myriad of nieces and nephews. She died of cancer in the pancreas on January 22 of this year, only three weeks and a few hours after she was diagnosed. Our eldest sister lost her husband of 20 years to a similar cancer just five months before Sapi passed. His passing was the reason Sapi moved back home: to help our sister and her young family with their loss. Sapi was electric. She had a vivacity that no one else in our family could keep up with. She knew exactly how to make anyone happy, and she especially spoiled Dad. She loved her friends and did practically anything for them, and in turn they all turned to her for guidance, love, and plenty of smiles. She loved to dance and sing, especially hula. She lit the stage like phosphorous waves at midnight when she danced. She was also a really good swimmer and cook, and her cooking provided great job opportunities for her to sustain herself and give to others throughout her years. She was a tough but good teacher at everything she knew. I learned from her to drive a car, dance hula, swim, cook, find directions around a city, flirt with guys, and serve others. I don't know that I successfully mastered the guy-flirting lessons, though. :-P I have learned two important lessons from her: love and love right, and "Don't think; just drive." Before she was diagnosed, she knew it was her time to go. She only had one last request before she left this Earth: to be with her family one last time. Of all the people she knew and loved, her family was her number one. She requested to be buried in Hawaii near our paternal grandfather, and I am the lucky few in our family who live near her now. Her spirit radiates through us today, and I am so grateful to know that I can see her again. 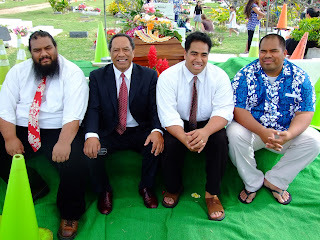 The losses of our sister and brother-in-law in five short months of each other have been the hardest time in our family's life, but the Gospel of the Church makes these trials so much easier and more purposeful. I get to step back and re-evaluate my life, and I realize that many things I have wanted in my life don't matter in the end. Because no matter how rich, successful, famous, talented, gorgeous, elite, or powerful I may be on this life -- if I can't be with my sister again, if our families cannot be together forever, I am nothing.